Inspiration for a New Baby Quilt » What's Under the Needle? 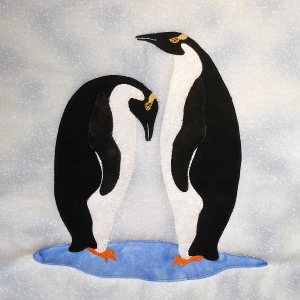 Inspiration for another baby quilt was gained a few months ago after visiting Oamaru's Penguin Encounter. It was quite chilly standing on the grassy bank at dusk waiting for penguins to return to their nesting beds for the night. The previous evening a good number had been spotted so we were hoping to get a glimpse, but alas, we saw only one. 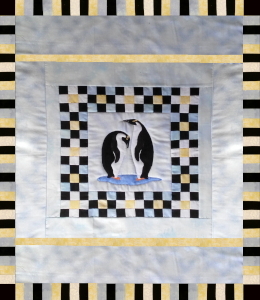 One or many, just the thought was captured to create a Penguin quilt. Last month I had published a single block and now it was time to get more creative. 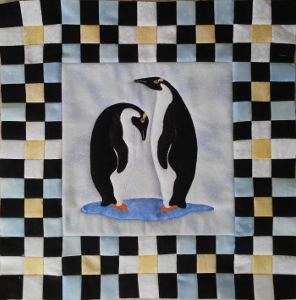 I added a checkerboard border first, using black, blue, yellow and white. Then to transfer from square to rectangular shape, I added an uneven border. 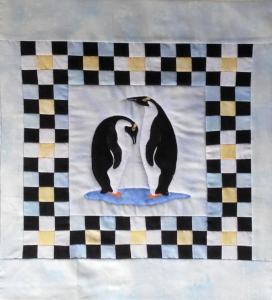 A double border to increase the length and a pieced one around the outside were added to complete this 30" x 38" baby quilt. It was fun and easy.... and a perfect gift to give away... that's after I quilt it of course.